A sleek mirror polished stainless steel saucepan range from Judge. Not only is it stylish but it gives you all need for the ultimate cooking experience in your home. 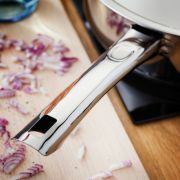 With efficient forged stainless steel bases for even heat distribution on all hobs. 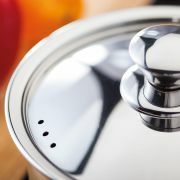 Saucepans have vented stainless steel lids and handles with hanging loops. Easy to clean, dishwasher safe and oven safe to 210°C.